10 out of five stars is pretty impressive, if I do say so myself. @ryanlemond @KySportsRadio how about if Ryan makes all 5 matt has to go to jail for a couple days?? Oh and most important Cal is our coach #BBN? Go ahead and add him to the list. Get Maci Morris’ autograph before she’s splashing threes in the WNBA next year. If EJ’s serious about only staying in if told he’s a first-round pick, I’d expect him to be back next year. Showed some potential, but another year in Lexington would do him wonders. No shame going through the pre-draft evaluation process. That’s why it’s there. Scream it from the mountain tops, TT! Matthew Hurt? Never heard of him. Ah, to be 19 and a future millionaire. Festivities at the annual Jordan Brand Classic tipped off today, with a competitive practice and scrimmage getting things rolling, followed by Media Day immediately afterward. Three future Kentucky Wildcats, Tyrese Maxey, Kahlil Whitney, and Keion Brooks each took the floor for the Home team, with UK forward target Jaden McDaniels also teaming up with them. After going through some drills, the Home and Away teams competed in an hour-long scrimmage, giving those in attendance a pretty solid opportunity to scout out the participants. Here is what I saw from the Wildcats, along with some other specific players of interest. Once again, Kentucky signee Tyrese Maxey proved to be one of the best players on the floor. With elite scoring skills, defensive intensity, and overall leadership skills, he’s a difference-maker on both ends of the floor. When it comes to making decisions, he’s excellent at feeling out his teammates and thinking two steps ahead. He knows when his team knows a big bucket, but he also knows when it’s time to be unselfish and find the open man for an easy basket. Oh yeah, and his jumper is still the silkiest in the class. Seriously, I have never seen Maxey miss two jump shots in a row. Never. I told you guys back at the McDonald’s Game that I felt he can be a 20-point-per-game scorer at Kentucky, and I really believe that. Outside of pure basketball talent, Maxey has a contagious personality that rubs off on everyone he comes in contact with. Whether he’s celebrating with his teammates or smack-talking the competition, he always has a smile on his face, and everyone around him really seems to appreciate that. One time this afternoon, the gym was too quiet for his liking, so he randomly started yelling, cheering, and clapping and wouldn’t stop until everyone else joined him. He likes everybody, and they all like him. I usually try not to play favorites, but I can already tell you right now that he’s going to be the exception next season. It’s going to be fun watching him in blue and white. For Whitney, like we saw at the McDAAG and the practices leading up to it, it’s really difficult to get a feel for his true game at events like this. The opportunities for true breakout moments are minimal for athletic small forwards because it’s a guard-heavy style of play, with big men feasting on cleanup baskets around the rim. With Whitney not being a dominant shooter and not focusing on rim-running like the traditional forwards, he doesn’t get the ball in his hands too much. And when he does, it ends up being awkward isolation basket attempts against a clogged paint that rarely end well. As much as I love his game and believe it will translate well to the college game, this event just isn’t the right event to show that. As far as what I did like, though, the 6-foot-7 small forward had several impressive fadeaway 12-foot jumpers fall, something he has been working on the past several months. That will be deadly at Kentucky next season. Beyond that, he was extremely aggressive on defense and really impressed on the glass. His timing and instincts are pretty strong, allowing for rebound opportunities on both ends. His mechanics are there shooting, but the consistency is not. He also needs to tighten his handles just a bit. Those will be his two biggest flaws at Kentucky next season. With Kentucky signee Keion Brooks Jr. missing the cut for the McDonald’s All-American Game back in March, this was my first time seeing the newest Wildcat in an All-Star Game setting against the best of the best in his class. And the 6-foot-8 forward sure didn’t disappoint. He shot extremely well both in warmups and drills, specifically in catch-and-shoot opportunities. His athleticism is there, he runs the floor well, and he has strong instincts while driving to the basket. In the scrimmage, he had just a few jump shot attempts, but he made his presence known in transition. He tends to get a bit out of control at times, needs to tighten his handle, and he needs to hit the weight room a bit, but overall, I think Brooks proved he absolutely belonged on the floor today. Kentucky target Jaden McDaniels is rated as one of the top 2019 prospects in the nation, but it’s apparent recruiting analysts are using that based on future expectations and potential, not how they’re expecting him to play at the college level. As much as I love McDaniels as a future NBA prospect, I’m starting to get really worried about his instant-impact ability at the college level. He has a solid jump shot and his length allows him to contest shots on defense, but I genuinely feel that he disappears on the floor more often than he’s involved in the action and makes elite plays. For every one play that I come away extremely impressed with the 6-foot-11 forward, there are three more that I hope for more. He had one phenomenal block in the post, and then followed it up just a few possessions later with a nasty alley-oop slam on the other end. It’s apparent he has all of the tools to be a future star in the NBA, but will things click for him in his likely one season in college? I just don’t know. If you’re deciding between one season of potential graduate transfer Kerry Blackshear Jr. or one season of McDaniels, I think you’d have to go for the guarantee in Blackshear over potential in McDaniels. Kentucky fans may not like the sound of this, but I think Louisville got their hands on a stud in five-star small forward Samuell Williamson. He didn’t shoot particularly well during warmups or drills, but when the scrimmage started, Williamson turned into one of the best players on the floor. He was able to find his shots with ease, making something out of nothing more often than not. At one point, the rest of players stepped to the side and let the future Cardinal put on a show in isolation on four straight possessions. At 6-foot-7, Williamson is long and can make incredibly difficult shots over smaller defenders. After a few made jumpers, some of his teammates, including Tyrese Maxey, began comparing him to current Boston Celtic Jayson Tatum. “J-Tatum ain’t missing that shot,” Maxey said after one baseline 15-footer. He’ll be a great player for the Cards next year. In my first time watching him since then, the 6-foot-7 forward really struggled. His shot was off, he wasn’t active on defense, and he really didn’t show off his tremendous athletic ability at all. When his shots weren’t falling, his body language left a lot to be desired, lightly jogging back down the court and letting up on the other end. After talking to him at Media Day, he seems like a great kid, but I just didn’t like what I saw from him against elite competition. He very well might be a solid college player, but for today at least, the struggles were evident. The Denver Nuggets find themselves in a 2-1 series hole against an indomitable San Antonio Spurs team – one that has made the playoffs every season for more than the last two decades. The Nuggets, on the other hand, are experiencing its first taste of the postseason since 2013. There isn’t a player from that team currently on this roster. Denver may have finished with the second-best overall record out West, but the lack of experience outside of the regular season has doomed them so far. The one key cog preventing everything from shifting back into form and the 54-win offensive juggernaut they were all season has been Jamal Murray. Playing in playoff atmosphere for the first time ever has resulted in three incredibly rough games for the former Kentucky guard with one quick – but gigantic – breath of fresh air mixed in between. Let’s recap them real quick. The series kicked off with Denver trudging through a horrific shooting night as a team. Gary Harris was the only Nuggets starter to convert on at least half of his shot attempts. A mere six of the team’s 28 attempted three-pointers found their way into the bottom of the basket. And to cap it all off, Murray spilled out 16 misses on 24 attempts for 17 total points without making a shot beyond the arc. The Spurs would win Game 1 by five points and went into Game 2 rocking some intense confidence. And once again, Murray couldn’t buy a bucket. He started out a miserable 0-8 from the field through the first three quarters. Wide open jumpers from 18-feet were clanking out. The Spurs were wearing the same confidence that Murray desperately needed. And in the fourth quarter, he finally stole some. Murray exploded for 21 points in the final quarter of that game, bringing his dying Nuggets team back to “steal” a home game that San Antonio controlled throughout. That was supposed to be the turning of the tides for Murray. His head coach was injecting confidence into him like an intravenous drug. He couldn’t miss a damn shot in those final 12 minutes. All the things that make Murray so tantalizing and promising were put on display for that lone quarter. Then Game 3 showed everyone why he hasn’t quite yet taken it to that next gear filled with future All-Star selections. Murray has not “taken the leap”, so to speak. He made a considerable jump in production from his rookie to sophomore season, but now in year three, he can’t seem to shake the question marks that follow him. Game 3 was the biggest indication of that all season. Derrick White, the Spurs second-year guard from Colorado who at one point had to find a basketball home playing Division II hoops in Colorado-Springs, lit Murray up for 36 points, five rebounds, and five assists on 15-21 shooting in Game 3. Murray’s stats? Six points in 31 minutes. 2-6 shooting. Four turnovers. A minus-25 in the box score. Murray was extinguished before he could even get the coals burning. Game 4 will be monumental in several ways. First off, it’ll decide the series. If the Spurs win Game 4 in San Antonio, there is no chance the Nuggets win three in a row, especially with one of those three games being played on the road. Denver is a sub-.500 road team this year, however a great home team. But if they lose Game 4, this series might as well be over. The second important note about this series is it’ll determine if the Nuggets are “for real” or not. Running into a Spurs team that craps out second-round All-Stars during the middle of a playoff series definitely doesn’t help, but the Nuggets are better than this team. They just are. But experience speaks volumes and it’s screaming into the rafters right now. Because the reality is the Nuggets are legit. They won 54 games. Of course they’re for real. But the playoff environment isn’t for everybody. Which brings me to my final point. Maybe Jamal Murray – along with Nikola Jokic – isn’t ready for the moment? Paul Millsap has been the one steady constant for Denver. And he can thank his several years of playoff experience for that. Murray and Jokic are fresh into this new challenge and only Jokic has been able to somewhat handle it properly. Murray clearly isn’t ready for this moment yet. If he was, he wouldn’t have played as poorly as he did in Game 3. There’s just no other way around it. But that’s what’s so great about the NBA playoffs. It’s onto the next game. Game 4 will be the biggest event Denver has played in years. If Murray doesn’t show up, the Nuggets won’t win. He hasn’t been ready for the moment through the first three games, but he can mend all of that by heading back home to Denver with a tied series. Hey Kentucky! has spent all week interviewing candidates for Kentucky’s Governor race so the show brought on Ryan Lemond to ease you into the weekend. On tonight’s episode, Matt Jones and Lemond run through both the good and the bad news from the week, including bad news for bacon fans and good news for Beyonce stans. Make sure to watch the rest of the show, too. 2019 five-star power forward Jaden McDaniels has never been one to eat up attention or go out of his way to make headlines for anything outside of basketball. Even when it comes to basketball, he doesn’t like talking about his recruitment, he doesn’t goof off around his teammates, and he really doesn’t try to be flashy. He goes about his business, makes as much of an impact on the court as he can, and moves on. Nothing more, nothing less. At the Jordan Brand Classic Media Day, reporters huddled around McDaniels to ask the ever-popular question about his recruitment: When is a decision coming and where will that be? Even with the signing period opening on April 17, the 6-foot-11 forward is still more than willing to push it all the way to the May 15 deadline in a little less than a month. “I’m still just taking my time and taking it slow,” he told KSR this afternoon. Other than the obvious required signing deadline in May, is there any personal deadline or or specific timetable on the table to make a final decision? “No, I really don’t…” he said. A man of many words, he is not. When asked if he had an update on his final five schools or wanted to cut his list even further before making a decision, McDaniels said he didn’t and that he was pretty content with those five. The final schools in contention? Kentucky, Washington, San Diego State, Texas, and UCLA. As for the hometown Washington Huskies, the perceived co-favorite with the Wildcats, the five-star forward said that playing in front of his friends and family is definitely a positive for him. For Texas, the draw there is to play for head coach Shaka Smart. With his brother, Jalen, playing for San Diego the last two years, he said that he’s very comfortable with the Aztecs because he has visited there so many times. While the first four schools McDaniels rattled off each seemed to be in solid position, his thoughts on UCLA really didn’t seem to indicate they had much of a shot at all. After competing in the Jordan Brand Classic tomorrow, McDaniels will then head to Philadelphia next weekend to compete in the Iverson Classic, his final high school event of his career. From there, McDaniels will head home and come up with a plan moving forward over the next few weeks. As much as he’s wanting to wait it out and make a decision at the last possible minute, the clock is ticking. Former Kentucky Wildcat and current Portland Trail Blazers center Enes Kanter suffered a bruised right hand during the first half of Game 2 against the Oklahoma City Thunder on Tuesday. According to the Trail Blazers, Kanter had an x-ray taken during halftime of that game but was cleared to return – which he did. Although, not without experiencing some discomfort throughout the rest of the game. During Friday’s shootaround, Kanter said he still expects to play in Game 3 on Friday night. The Blazers currently hold a 2-0 series lead over the Thunder in the first round of the Western Conference Playoffs. Kanter was excellent in Game 1, posting 20 points and 18 rebounds, but foul trouble in Game 2 limited him to only six points and five rebounds. Kanter had three fouls at halftime of Game 2 and injured his hand in the second quarter, which could have also contributed to his lack of minutes. Regardless, Kanter has been an important piece for the Blazers thus far and should be for whatever remains of this series. Heading back to OKC – Kanter’s first road playoff game against his former team – the pressure is all on the Thunder. And as long as Damian Lillard continues to do Damian Lillard things, it may not even matter if Kanter isn’t 100 percent. Listen to what Kanter had to say about returning to OKC. Kanter returns to his former home for Game 3 of the playoffs.Will the Thunder fans cheer or will they boo? Game 3 tips off at 9:30 P.M. (EST) on ESPN. A week from now, we’ll know where some of Kentucky Football’s most talented players will continue their careers. In the first of many media appearances in the coming days, Mark Stoops went on NFL Network’s “Up to the Minute” today to brag on his draft prospects, starting with Josh Allen, who is projected to go in the top five Thursday night. Most draft experts have Lonnie Johnson going around the fourth round, but his stock is rising, with the NFL Network’s Daniel Jeremiah projecting him to go as high as 20th overall to the Pittsburgh Steelers. Stoops said Lonnie’s only scratched the surface of his potential. Of course, Stoops was also asked about Benny Snell, who met Snell Yeah the horse at Keeneland yesterday. Sadly, NFL Network won’t let me embed the video for you, so click here to watch it on their site. Kentucky’s 2020 recruiting class has lost another offensive lineman. A week after visiting Lexington for the annual Blue/White Game, Richie Leonard announced he has re-opened his recruitment. Leonard was the Cats’ first commitment in the 2020 class. Recruited by Darin Hinshaw and John Schlarman, he joins Gerald Mincey as the second Florida offensive lineman to de-commit once Florida’s Big Three schools got more involved. Since committing last October, Leonard picked offers from Florida State, Miami and Tennessee. He visited the latter on his way home from Lexington. Two weeks ago he explained why he kept his recruiting options opened. 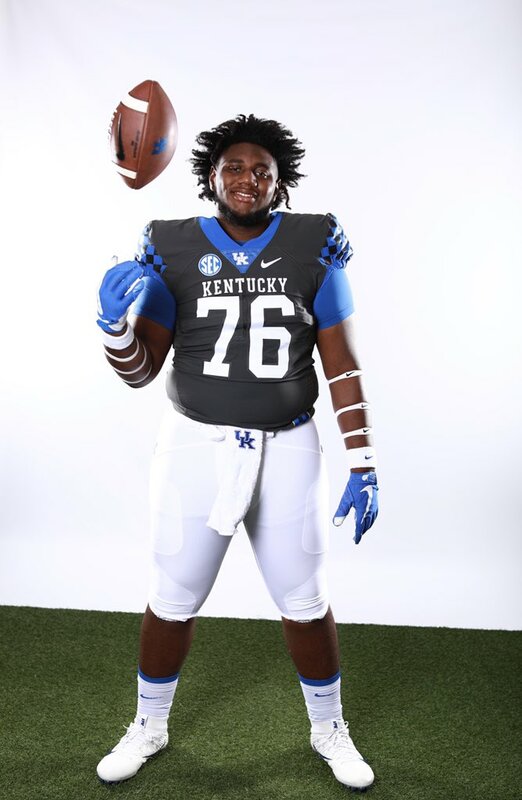 Without Leonard in the fold, four-star defensive tackle Lamar Goods is UK’s only commitment in the 2020 class. That could change when four-star offensive tackle John Young announces his decision April 29. With NBA Draft decisions rolling out, now’s a good time to go over the rules and deadlines for early entrants. Let’s start with the rules, which have changed in the wake of the FBI college hoops scandal. After the FBI’s report into bribery in college hoops went public last year, the NCAA voted to change the rules to allow players to be represented by NCAA-certified agents after the season as long as they request an evaluation from the NBA Undergraduate Advisory Committee (UAC). Agents will be allowed to pay for meals, transportation, and lodging for players and their families during the agent selection process and meetings with teams; however, players must end that relationship if they decide to return to school. The feedback will start rolling in to players and their coaches around April 1 and continue through the early-entry deadline of April 21. Players who decide to stay in the draft through the Combine will continue to receive feedback through May 29, the NCAA’s deadline to withdraw. A new addition to the evaluation process is the G-League Elite Camp, a three-day scouting event in Chicago for the top 40 prospects not invited to the Combine. The top performers from the G-League Elite Camp will also be invited to the Combine. In the fall, the NCAA proposed allowing undrafted underclassmen to return to school as long as they requested an evaluation from the UAC and participated in the Combine. Many outlets have reported that as a new rule change; however, after speaking with an NCAA spokesperson, I found out the proposal is contingent on the NBA and NBA Players Association changing their rules to make players who return to college after the draft ineligible until the end of the following season. I’ve reached out to the NBA for clarification on the matter but have yet to hear back. The rule change is a great idea, but for now, it’s still on the shelf. Once a player’s season is over, they can request an evaluation from the NBA Undergraduate Advisory Committee. Once the evaluation is requested, they can sign an agreement with an NCAA-certified agent. Derek Willis participated in this seniors-only event a few years ago; I’d say the odds are high that Reid Travis will do the same. By this date, we will know everyone who has declared for the draft. The top 60 draft prospects (as voted on by NBA teams) will be invited to the Combine. The next 40 prospects will be invited to the G-League Elite Camp. The top performers from this camp will receive invites to the Combine. Separately, 40 of the best current G-League players will also work out and scrimmage in hopes of finding a place on an NBA roster. The full draft order will officially be set on May 14, giving the top players a clearer picture on where they may go. PJ Washington turned heads at last year’s Combine but was told his stock could improve if he returned to school to work on his shooting and conditioning. Now, he’s a projected lottery pick. If any of his teammates receive similar feedback, will they follow his path? This is the big one. Ten days after the combine, underclassmen who wish to retain their eligibility must withdraw their names from the draft. Underclassmen can withdraw from the draft twice before exhausting their college eligibility. For example, EJ Montgomery can test the waters this year and next, but if he declares for the draft after his junior season, he must stay in. Or, as John Calipari puts it, Graduation Day. As expected, five-star power forward Matthew Hurt has committed to Duke. The Rochester, Minnesota native announced the news at a ceremony at his school this afternoon, picking the Blue Devils over Kentucky, Kansas, and North Carolina. Whereas it seemed Kentucky might have a shot with him a few weeks ago, when his family canceled an in-home visit with John Calipari over the weekend, the writing was on the wall. Kentucky’s 2019 class stands as such: combo guard Tyrese Maxey, small forward Keion Brooks, small forward Kahlil Whitney, and small forward Dontaie Allen. Maxey, Brooks, and Whitney will all be in action at the Jordan Brand Classic tomorrow night in Vegas. Jack Pilgrim’s out there to cover it for us and will have highlights from today’s practices in just a bit. Juzang, a 6-foot-7 shooting guard/small forward out of Studio City, CA, is considered a consensus top-25 prospect in the class of 2020. ESPN lists him as the No. 19 overall prospect in the class, while Rivals has him at No. 22 and 247 Sports lists him at No. 24 overall. He already holds offers from Kansas, Virginia, UCLA, USC, and others. Over the next two weeks a handful of former Kentucky Wildcats will be taking their talents across the Commonwealth to meet the Big Blue Nation. Jonny David and Maci Morris will make three stops next week. At the signings you’ll get an 8×10 with each player’s signature for $15. For more info reach out to Bookings@ProPlayerSolutions.com. P.J. Washington is putting a few more miles on his new whip. The future first round draft pick will make eight stops in ten days to complete his second and final signing tour. Don’t forget that Tyler Herro and Keldon Johnson will also be touring the state next week. Keldon will be at KSBar on Monday night, Tyler on Wednesday night. Tickets to save your space in line are now available at the KSBar hostess stand, so get on down there. Sean Miller and Will Wade should be thanking their lucky stars right now because a federal judge just ruled that they won’t have to testify in the upcoming college hoops trial. The Arizona and LSU coaches were subpoenaed by Christian Dawkins’ attorney in February, but U.S. District Court Judge Edgardo Ramos ruled this morning that because Dawkins and his fellow defendant Merl Code did not bribe Miller or Wade specifically, their testimony is irrelevant (they did bribe Arizona assistant coach Emanuel “Book” Richardson, Oklahoma State’s Lamont Evans, and USC’s Tony Bland). Still, Dawkins’ attorney Steven Haney dangled the bait out there for the rest of us. “The evidence establishes very clearly that Sean Miller is paying players at Arizona,” Haney said during Friday morning’s hearing. Dangit. The NCAA can still come after Miller and Wade, but it’ll be a lot tougher without those tapes and their testimony. The trial begins Monday. Good morning, folks. So Jamal Murray might not be officially *back*. Let’s talk NBA Playoffs. The Philadelphia 76ers were without their All-Star and best player Joel Embiid against the Brooklyn Nets in Game 3. It might have been the most complete game Philly has played through the first round. Ben Simmons poured in a playoff career-high of 31 points to finally silence the “beef” between himself and Nets forward Jared Dudley (not sure how someone at a level such as Simmons can get in the middle of petty dad-level beef with Jared freaking Dudley but whatever). The Nets begged Simmons to attack the basket, giving him endless amounts of room to do so, and he burned them all night for it. Simmons also shot 11-13 from the field in addition to nine assists. Tobias Harris and JJ Redick combined for 55 points while D’Angelo Russell and Caris LeVert both added 26 points apiece for the Nets. Well, the thought of a Jamal Murray revival sure was fun for about 36 hours, until Denver went to San Antonio for Game 3. Murray posted a mere six points on 2-6 shooting to go along with only two assists and four turnovers as he watched Spurs guard Derrick White pop off for a career-high 36 points (remember when I said a week ago that White is really good? Well, turns out he is, indeed, really good). Murray was minus-25 in 31 minutes. Every time the Nuggets would break out for a lead or go on a run, the Spurs always had an answer, often time in the form of their own double-digit runs. San Antonio has still yet to lose at home against Denver this season and they boast one of the best home-court records in the entire league. Game 4 might just be a must-win for Denver. They’re gonna have to steal one on the road at this point. With the sad news of DeMarcus Cousins being lost for the season still resonating, the Warriors didn’t let that distract them from pounding the Clippers and making a statement in Game 3. Los Angeles found themselves down 31 once again in this game – just as they were in Game 2 before a miraculous comeback – but there was no fighting their way out of this one. Kevin Durant was way too hot (38 points in 30 minutes). Steph Curry had 21 in 20 minutes despite dealing with foul trouble. Over half of the Clippers starters couldn’t buy a bucket. The writing was all over the wall in this one. There would be no matching comeback. Shai Gilgeous-Alexander struggled in Game 3, recording seven points on 1-7 shooting while dishing out only two assists. He was a minus-33 in 22 minutes of action. Keldon Johnson and John Calipari were also at Staples Center to watch SGA.